Direct CO2 conversion has continuously attracted a great deal of attention as a technology to produce fuels and chemical building blocks from renewable energy resources. Specifically, substances such as carbon feedstocks and fuels can be produced by utilizing sunlight, water, and CO2 as semiconductors and a water interface through photoelectrochemical CO2 reduction. A KAIST research team demonstrated a novel photoelectrode structure for highly-selective and efficient photoelectrochemical CO2 reduction reactions. The research team led by Professor Jihun Oh of the Graduate School of EEWS (Energy, Environment, Water and Sustainability) presented a Si photoelectrode with a nanoporous Au thin film that is capable of reducing CO2 to CO with 90 percent selectivity in aqueous solution. The research team’s technology will provide a basic framework for designing the semiconductor photoelectrode structure necessary for photoelectrochemical conversion. In order to achieve steady conversion of CO2, it is necessary to use a high-performance catalyst to lower overpotential. Among the metal catalysts, Au is known to be an electrocatalyst that converts CO2 to CO.
Conventionally, bare Au, as a catalyst, produces a lot of hydrogen gas due to its low CO selectivity. In addition, the high cost of Au remains a challenge in using the catalyst. Professor Oh’s research team addressed the issue by creating a nanoporous Au thin film formed by the electrochemical reduction of an anodized Au thin film. 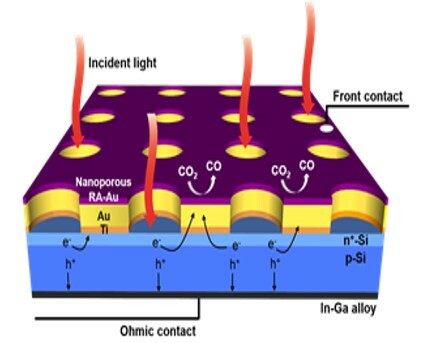 As a result, the team could demonstrate an efficient, selective photoelectrochemical reduction reaction of CO2 to CO using electrochemically-treated Au thin films on a Si photoelectrode. The electrochemical reduction on anodized Au thin films forms a nanoporous thin layer exhibiting many grain boundaries of nanoparticles on the Au surface. This dramatically improves the selectivity of the reduction reaction with a maximum CO faradaic efficiency of over 90% at low overpotential and durability. The research team also used an Au thin film of about 200 nanometers, 50,000 times thinner than previously reported nanostructured Au catalysts, resulting in a cost-effective catalyst. When depositing the catalyst on the semiconductor surface in the type of nanoparticles, the substrate of the thin film will be affected in the course of electrochemical reduction. Thus, the research team designed a new Si photoelectrode with mesh-type co-catalysts that are independently wired at the front and back of the photoelectrode without influencing the photoelectrode, and made it possible for electrochemical reduction. Due to the superior CO2 reduction reaction activity of the nanoporous Au mesh and high photovoltage from Si, the Si photoelectrode with the nanoporous Au thin film mesh shows conversion of CO2 to CO with 91% Faradaic efficiency at positive potential than CO equilibrium potential. Professor Oh explained, “This technology will serve as a platform for diverse semiconductors and catalysts. Researchers can further improve the solar-to-CO2 conversion efficiency using this technology. This research was published in the inside front cover of Advanced Energy Materials on February 8, 2017. The research was funded and supported by the Korea Carbon Capture & Sequestration R&D Center. Professor Sung-Yoon Chung of the EEWS also participated in this research.